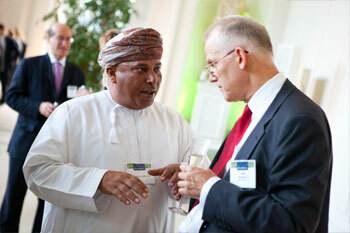 LONDON, April 19, 2013—Duane Morris hosted a private reception on April 17 in celebration of the launch of its new joint law venture with the Al Mashaikhi Law Firm, a multi-practice law firm in Muscat, Oman. The event took place at the Orangery at Kensington Palace in London. Attendees included foreign dignitaries, including His Excellency Abdulaziz Abdullah Zahir Al-Hinai, the Omani ambassador to the United Kingdom, as well as the honorable Faisal Al Houli, Deputy Head of the Embassy of the State of Kuwait to the United Kingdom; and leading members of the private equity, banking and legal industries in London. Duane Morris Chairman John Soroko delivered brief remarks, as did the name partner of the new joint venture, Dr. Said Al Mashaikhi, and Sheikh Salim Al-Mashani, chairman of ICT, LLC, an influential investment banking firm with significant interests in the country. On March 26, 2013, Duane Morris officially announced the creation of the joint law venture, the Dr. Al Mashaikhi and Partner Law Office, a GCC representative office of Duane Morris. The official release provides further details and can be found at http://dnmrs.co/r4808. Jeffrey Rodwell, Duane Morris partner and managing director of the joint venture, focuses his practice on infrastructure projects, international mergers and acquisitions, capital markets, outsourcing, financial services, and oil and gas exploration and trading in the Middle East, India and Africa. Formerly of the firm's London office, he has relocated to Oman to provide on-the-ground counsel and management oversight. Dr. Al Mashaikhi has more than 15 years of experience practicing law in Oman and surrounding GCC countries. His experience encompasses legal work for banking and financial services clients, construction projects and disputes, foreign investments, and work in business and commercial law and foreign claims. Duane Morris will coordinate its Omani involvement through its London office, but also expects significant interaction with its New York, Vietnam and Singapore offices. 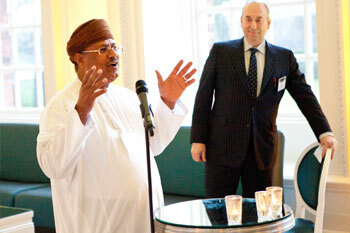 Duane Morris' interest in Oman was sparked by its relationship with ICT. Duane Morris previously expanded its global footprint with the formation in 2010 of an enhanced joint law venture with Selvam LLC in Singapore, creating Duane Morris & Selvam LLP, followed in 2011 by a strategic alliance with Mexico City firm Miranda & Estavillo. Duane Morris has offices in London, as well as in Hanoi and Ho Chi Minh City in Vietnam, in addition to its 20 U.S. locations. Operating from its home base in Muscat, Oman, the new joint venture will represent clients in both inbound and outbound transactions originating in Oman, as well as in the other five member countries of the Gulf Cooperation Council. The joint venture will focus on major areas, such as project, equipment and asset-based finance; trade finance; real estate; private equity and sovereign wealth funds work; and Islamic finance. The firm will handle dispute resolution matters through its domestic constituent firm. Duane Morris LLP, a global law firm with more than 700 attorneys in offices across the United States and around the world, is asked by a broad array of clients to provide innovative solutions to today's legal and business challenges.